Iceland may not top the tables for species numbers but if you’re after a birding holiday combined with jaw-dropping scenery, the island takes some beating. With insider knowledge, you could tick off 60-80 different species and some you’ll be seeing in the thousands – that’s where Iceland pips the post as a birding destination. Late May and June are prime time as all migrant birds have arrived and many species are highly visible as they pair up and defend their territories. Winter can be surprisingly good too, especially in coastal areas of the west and south. Atlantic puffins flying to and from their cliff burrows; confiding red-necked phalaropes spinning circles on a roadside pond; Slavonian grebes courtship rituals; the other-worldly call of a great northern diver; guillemots and razorbills jostling for space on Europe’s largest bird cliffs; torpedo-like gannets diving for food; the gathering of thousands of noisy non-breeding whooper swans on a coastal lagoon; Icelanders fondness for celebrating spring with the arrival of the first golden plover – “Lóan er komin!”. With a little effort you’ll track down Barrow’s goldeneye, great northern diver, harlequin duck, gyrfalcon and white-tailed eagle. 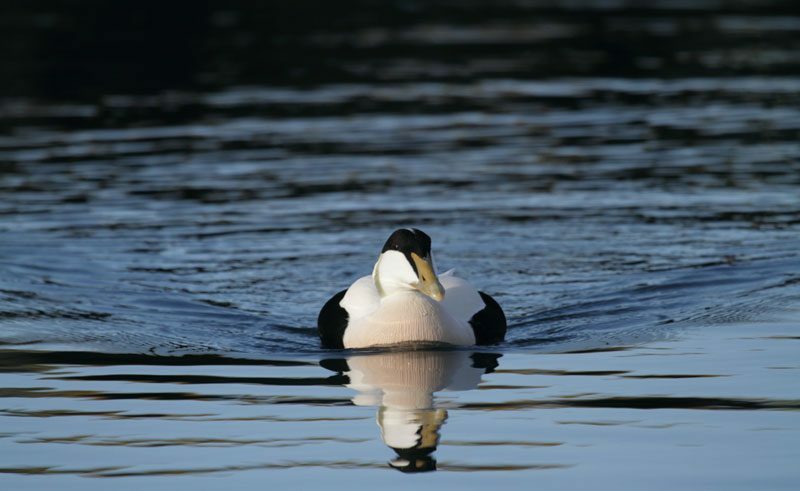 For king eider and red phalarope it’s about knowing where and when to go. For snowy owl, try crossing your fingers! This arm-shaped peninsula off the west coast is a microcosm of the whole island, with year-round birding and a variety of habitats. 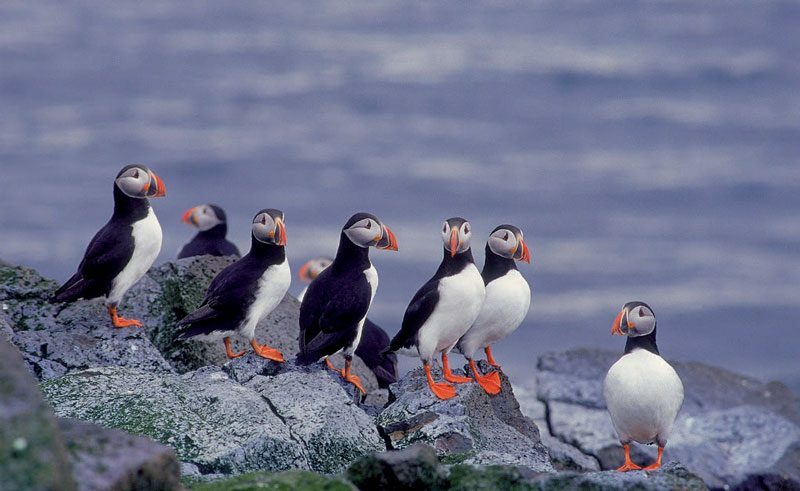 Look for wildfowl on the ponds and lakes of the south shore; guillemots on the lava cliffs at the tip of the peninsula, kittiwakes among basalt columns and lava arches at Arnarstapi, Iceland’s largest arctic tern colony at Rif, glaucous gulls nesting on the ice-scoured mountains of the north coast, puffins on Melrakkaey, an island reserve, and white-tailed eagles in the Berserkjahraun lava. In winter, Iceland and glaucous gulls abound and you’ll find the occasional king eider among the flocks of common eider; white-tailed eagles soaring above the fjords or perched on lava outcrops; purple sandpipers, harlequin ducks and long-tailed ducks all visible from the shore; flocks of snow bunting gather at feeding stations in the towns. With luck you may see Arctic fox, roaming the wild surrounds of ice-capped Snaefellsjokull volcano and encounter rock ptarmigan, often surprisingly confiding. Hop on a whale watch trip from Olafsvik (summer) or Grundarfjordur (winter) for a chance to see orcas, sperm whales, humpback whales and others, together with many different sea birds, depending on the time of year. An area of global importance for bird conservation, shallow Lake Myvatn is fed by spring water, flowing under the lava beds that surround it. Each summer, the lake hosts a banquet of insect larvae, attracting tens of thousands of ducks to nest around the lake. 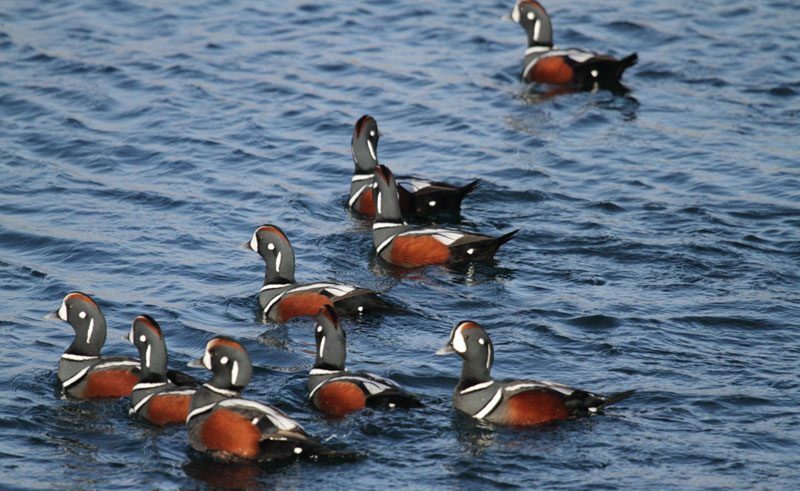 Arriving in late April and early May the 13 species include tufted duck, scaup, red-breasted merganser, wigeon, gadwall, mallard, harlequin duck and the resident rarity, Barrow’s goldeneye. With luck you might run into gyrfalcon, taking advantage of plentiful prey and present in small numbers. 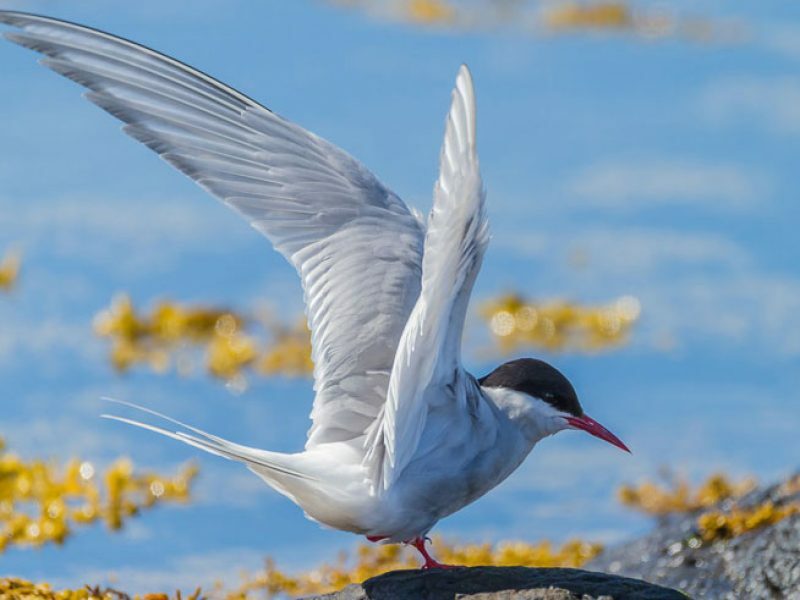 For bird hides and more information, visit Sigurgeir’s Bird Museum but also take time to explore the volcanic oddities forming an intriguing backdrop to the wildlife spectacle. Iceland’s largest natural lake and its rivers, meadows and birch scrub are easy to visit on a day trip from the capital. Here you’ll find great northern diver, whooper swan, tufted duck, scaup, harlequin duck, greylag goose, Barrow’s goldeneye, common goldeneye, red-breasted merganser and goosander. This is also good habitat for gyrfalcon and merlin, black-tailed godwit, whimbrel, snow bunting, redwing and arctic tern. Walking trails hug the lakeshore and penetrate the birch scrub, away from the busy tourist hub of the Althing assembly site. It’s hard to comprehend the scale of the 14km long and 440m high Latrabjarg cliff – it’s monumental. You can hike the length of it but there’s actually no need to as the puffins, guillemots and razorbills are easiest to view at the western end, close to the lighthouse. While you’re admiring the birds, spare a thought for the dozens of ships wrecked in storms on the rocks below you and the rescue teams who risked all to save them. Their story is told at the quirky Hnjotur Museum, where you’ll also learn how the locals scaled the cliffs gathering birds’ eggs to supplement a diet of fish and lamb. Heading north through the West Fjords, pause by the bridge over Onundarfjordur, where the mudflats attract flocks of waders. Just ten minute’s drive from Keflavik airport, Gardskagi is the toe of the boot-shaped volcanic Reykjanes Peninsula. Rocky on the north side and sandy on the south, this famous midnight sun viewpoint is guarded by two lighthouses, Iceland’s tallest and one of its oldest. It’s also a well-known staging post for migrant birds. In late April and May, great flocks of knot, sanderling, ruddy turnstone, dunlin, purple sandpiper line the shore and northern gannet, European storm petrel and manx shearwater are seen in flight. On your way round the peninsula, stop off at Hafnaberg cliff, explore the dramatic coast by Reykjanestá lighthouse and while you’re there, take a whiff of the fuming, sulphurous Gunnuhver, Iceland’s largest geothermal mud pool. Don’t linger too long though as it’s haunted by the ghost of Gunna, who murdered her landlord after he stole her cooking pot. South of here, look for seabirds on Krisuvikurberg cliffs. Reykjanes excels in winter, with harlequin ducks, great northern and red-throated divers regularly spotted from the shore and gyrfalcon scouring for prey overhead. It takes some effort to reach this lonely village at the end of the road in Iceland’s far northeast. But for puffin addicts, this is arguably the place to see and photograph the tourist’s favourite bird, complete with a bill full of sand eels. Along with kittiwakes and a handful of common eiders, you’ll find the puffins nesting on a rocky outcrop by the town’s tiny harbour, a few miles beyond the village. And when you’ve had your fill of puffins, admire the chaotic craggy peaks that frame the fjord or take yourself off on a hike among them as this is one of Iceland’s best walking areas. Only one family lives on Flatey year round but in summer, the village of immaculately restored toy town houses comes alive when the ferry arrives. Part of the island is out of bounds as a bird sanctuary and everywhere the birds are confiding. Look for common redshank, common snipe, ringed plover, meadow pipit, arctic tern, black guillemot, Atlantic puffin and red phalarope. To protect the rare red phalarope, its breeding zone is totally off limits, but the bird can be seen along the shore outside the sanctuary area. There’s only one tiny hotel on Flatey – book early for a chance to stay overnight on this idyllic bird island. The east coast fishing village of Djupivogur is backed by wetlands, ponds and dunes accessed by easy trails. The locals have created a nature reserve with a bird hide. Shelduck, shoveler, Slavonian grebe and other wildfowl are breeders but the area is also good for seabirds and waders and in spring and autumn many migrants show up. Don’t miss the giant bird egg sculptures ‘Eggin i Gledivik’, on the harbour wall. If you have a few hours to spare, hop on a boat trip to the offshore puffin island of Papey or explore the glaciated mountains and finger-like fjords. The Iceberg Lagoon is dazzling in its own right but once you’ve filled your memory card with iceberg and shimmering glacier photos, take time to look at the area’s wildlife. Seals are the big draw as they swim up the river to gorge on the lagoon’s fish, competing with throngs of manic dive-bombing Arctic terns. Brent geese, common eiders and snow bunting are also around, as are red-throated divers, but they prefer the smaller roadside ponds. The sandy plains south of Iceland’s largest icecap are an important breeding ground for great skuas but they won’t be amused if you get close to their nest sites. The birch woodlands at Skaftafell are good for redwing and the Icelandic race of winter wren and offer easy walks over moorland and moraine to glacier viewpoints. While much of Iceland’s farmland is still being drained for cultivation, the farmer at Gauksmyri has done the reverse, reclaiming a former wetland area and creating a small but productive wildlife reserve for visitors. You’ll find a variety of birds in the area, including whooper swan, Slavonian grebe and red-necked phalarope on the lake and common redshank, common snipe, golden plover, whimbrel in the surrounds. Gauksmyri horse farm guesthouse does a tasty dinner buffet and you can stay overnight and meet the horses. 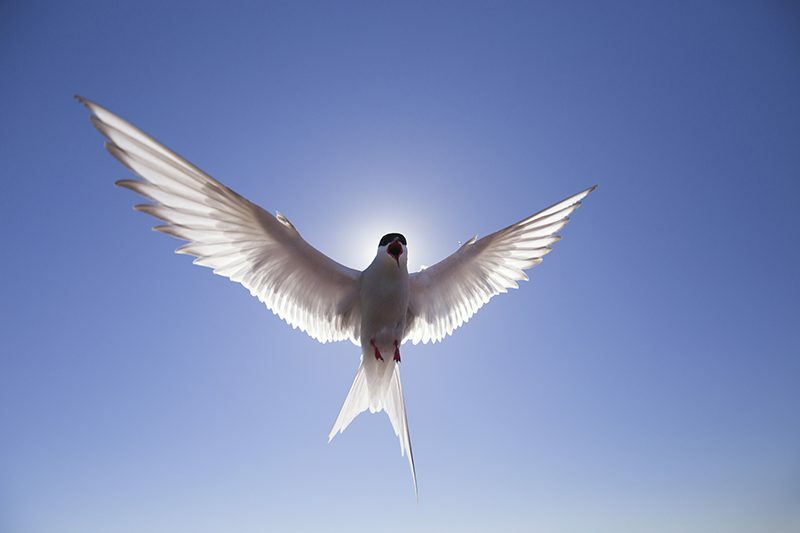 Our team of Travel Specialists can tailor make an Iceland bird watching itinerary for you! Call us on 01737 214 250 or send us an enquiry.